Donna Horn is a painter who works primarily in oil. Her abstracted landscapes are informed by a sophisticated sense of color, and textured surface created by repeated application and scraping of paint, mixed with cold wax medium. The images originate from sketches, photos, and memories of places seen on her walks, or in her travels. Donna came to painting later in life, despite an abiding interest in art since childhood. She lives in Atlanta with her husband, and maintains a studio in an artist complex in nearby Avondale Estates, GA.
I’ve finally decided to try blogging about my work. A new idea for me! I’ll see how it goes. Recently, I’ve been experimenting with a different approach: painting abstractly. This has appealed for some time, but I can’t quite manage to rid myself of some portion of the landscape imagery. 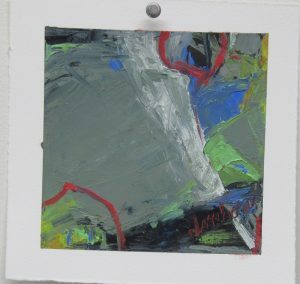 I have been painting a series of small pieces on Arches oil paper…which is specially treated to take oil paint without requiring gesso. It’s pretty cool. I like the way the thickened paint sits on the paper. I’ve posted a few of these below. Coming up with titles is often a challenge. These little paintings are no different. I’ve designated them by number and also named, if something occurs to me. I should add that they measure a little less than 6 inches square. I frame them in white square IKEA frames, floating on a white mat and like the effect of the border with its torn paper edges. 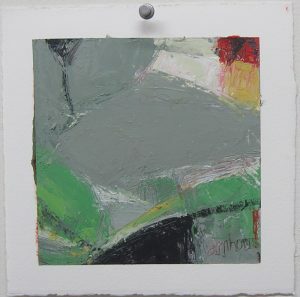 Abstract #3; “Greyscape”; 5.75 x 5.75 ins; oil/cold wax on Arches oil paper. 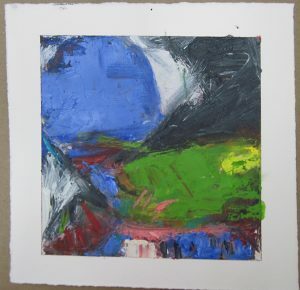 Abstract #1; “Blue Moon”; 5.75 x 5.75 ins; Oil/cold wax on Arches oil paper. 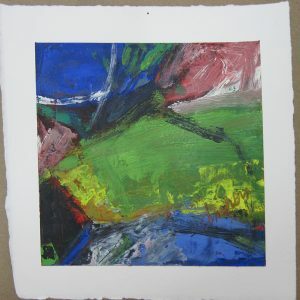 Abstract #4; 5.75x 5.75 ins; oil/cold wax on Arches oil paper. This entry was posted in Fine Art on May 1, 2017 by Donna.